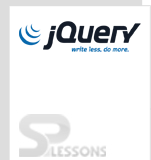 jQuery Examples chapter gives some examples using various classes, functions and effects. The first thing to do is to include the jQuery library to HTML page with a script tag. Now, add some event functions in DOM, it is good to practice write all the functions inside of a $(document).ready() function. <p>This area will contain the left content area. <p>This area will contain the center content area. <p>This area will contain the right content area. The hover function is applied to div element “left”.When hovered using mouse on left content area, the area color chanes from pink to red. The click function is applied to div element “center”.When clicked on that area, an alert box appears showing some message. The hide function is applied to div element “right”.When clicked on that area, the element area will be hidden. Write all DOM code inside script tag. See the Following code to check document page, whether fully loaded or not. When the document page loading is finished then the executed code block look like this. In below Example, use jQuery hover function demo with the help of jQuery library function to show how it will interact with programmer. How to Include External Script using jQuery? There will be many files in a website and it may not be possible to include script in the HTML file completely.So it is a good practice to include jQuery files externally and then link that page in the document. The main benefit here is it reduces complexity of coding and makes to easily understand and can reduce the file size of main page. Then include external.js file in main document as shown below. Include <script> in HTML head section. Add document ready function and event handling functions with required css style. External jquery file can be included in the main file using <script src=” “></script> tag.